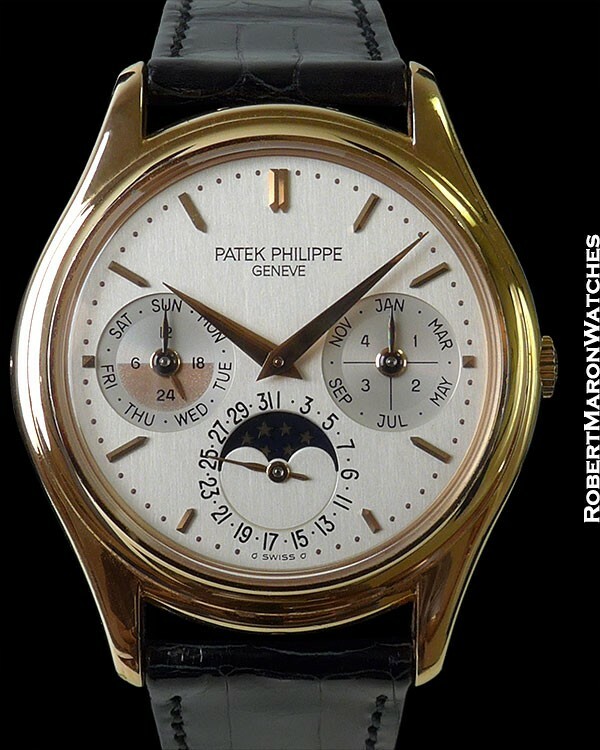 The Patek Philippe Reference 3940 may be the model that best captures what, at its essence, Patek itself stands for: quality, complicated, class and classic. Watches come in many shapes, sizes and with all manner of complications, but no watch is nicer looking or built better than this reference 3940 perpetual calendar. This particular New Old Stock 3940R features an interesting original dial, which does not fall into the known 3940 dial categories (i.e., "First Series", "Second Series", etc.). Instead, the 24 hour dial is shaded between '6' and '18' hours which is a characteristic of the First Series dials. 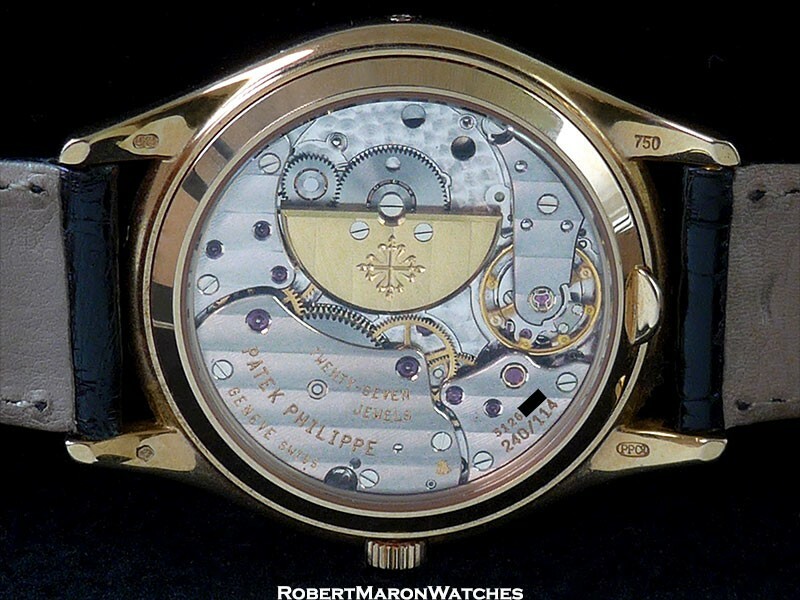 The leap year dial, on the other hand, features the cross hair leap year chapter which is a characteristic of the third, and final, dial series. 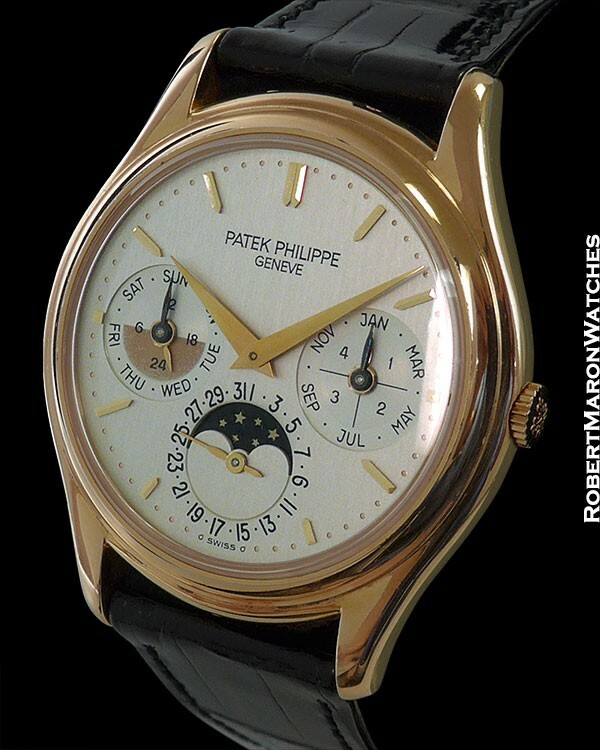 To take a cue from the collectable Rolex market, this is a "transitional" dial and, accordingly, a transitional 3940 model - which is something very rare indeed, in the world of Patek Philippe watches. Case is 18k rose gold, with dimensions of 36mm diameter by 8.5mm thick. Sapphire front and display back crystals. Movement is the Patek Philippe automatic Caliber 240 Q with 22k winding rotor, 27 jewels, 275 individual parts, with power reserve of approximately 46 hours. The caliber is engraved with the Geneva Seal, attesting to its technical and aesthetic superiority. Strap is hand-sewn premium quality crocodile with a 18k rose gold Patek buckle. Watch is new old stock with box and papers, second back and stylus.